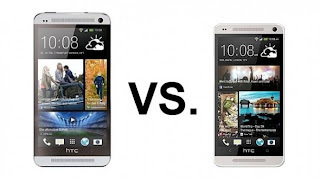 HTC One Vs HTC One Mini: Is Big Really Better? HTC One Mini was introduced by the manufacturer just to imply to the user that the bigger isn't necessarily the better. Also, as Samsung and other rival smartphone manufacturers were already coming out with the lite or Mini version of phones, it made sense for HTC to introduce a Mini version of its one of the most successful models. Even though the name and the look of both these devices are same, there are quite noticeable changes in the features of the two. Obviously, HTC One is much bigger in size than the mini version. It’s around 0.2 inches longer and wider than mini and the screen is around 0.4 inches bigger than the latter. Both, HTC One and HTC One Mini are powerful devices, still the OS installed in One Mini is more advanced , i.e., Android version 4.2.2 against the Android version 4.1.2 installed in its big brother. However, as far as the CPU of the devices are concerned HTC One leads with Qualcomm Snapdragon 600 Quad-Core as against the Qualcomm Snapdragon 400 MSM8930AA Dual-Core of One Mini. It’s not just the size of the screen that is smaller in HTC One Mini but also the screen resolution is 1280 x 720 pixels, which is lesser than 1920 x 1080 pixels of HTC One. The pixel densities of the devices are 341 pp and 468 ppi respectively. HTC One uses a ultrapixel technology for camera, which is a new concept and it sports a 4 ultrapixel camera that give brilliant results even in low light conditions. Apart from it there is a 2.1 MP front facing camera in the device that is used for video calls and video chats. On the other hand, HTC One Mini sports a similar camera with the only difference being that the front camera has got a 1.6 MP camera. As far as the connectivity options in both these devices are concerned, both of them features a Bluetooth 4 version and GPS is also present. However, Near Field Communication or NFC is only present in HTC One and not in the Mini version of the device. Both of these devices lack memory card slots. HTC One is no doubt a powerful phone, however considering the low price of HTC One Mini it’s also a good deal for average smartphone users. Anzer Khan is a professional article writer and specializes in writing mobile phone reviews. He is a technology lover and loves to read books and listen to music. You should look out for the superb and money saving HTC One Deals UK for best offers.